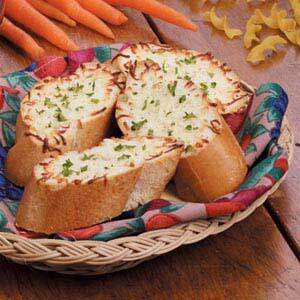 Warm, cheesy, and garlicky, this bread makes a great side to soup, Italian meals, or even for lunch. Spread butter over bread. Sprinkle with garlic powder and cheese. Place on an ungreased baking sheet. Bake at 400° for 5-7 minutes or until cheese is melted. Sprinkle with onions or parsley if desired. Serve warm. Yield: 2 servings.